Not everything on here is just about the mighty Filofax, I'm equally passionate about stationery and all things office. Christmas was a much less extravagant affair this year but I still had plenty of quality family time, however, gifts were also a lot less extravagant! My sister purchased a few items for me that are definitely stationery and office related, a book and a pen! The book is titled "The Checklist Manifesto" by Atul Gawande and published by Profile Books. I'm not going to review the book on here just yet, partly because I need to read and secondly my blog isn't about books. The pen is an AirPress made by Tombow who are based in Germany, supposedly it writes on wet paper and can be used upside down, something I need to test first. It writes very comfortably although the pen shell is quite chunky, the nib is black ink with 0.7 ball making it in the fine category. I'm just in the process of having a good clear out after having moved house a few months ago, finally I'm getting around to sorting through the far too numerous binders and planners that I have. I was lucky enough to buy a large box of Filofaxes late lest year, 10 in total, I chose a few that I wanted to keep and plan to sell the rest via eBay. 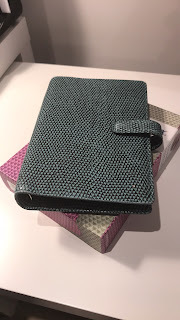 Today I am featuring the Filofax Chameleon in personal size, a organiser considered to be of high quality and potentially somewhat rare.